It's important to take your child to the dentist. But what age should a child go to the dentist? It's earlier than you think. Click here and find out more. Regular dentist visits are important for children starting at a very young age. Unfortunately, a significant number of children do not regularly visit the dentist and leave cavities untreated. In fact, over 15 percent of children aged 2-17 have not seen the dentist over the past year. An even greater number of children leave cavities untreated. In a survey period from 2011 to 2014, nearly 19 percent of children aged 5 to 19 had untreated cavities. The importance of taking your child to the dentist cannot be stressed enough. Many parents want to know what age should a child go to the dentist for the first time. The answer is a surprise to many parents. Read on to learn more about what age should a child go to the dentist. Also, we'll explore the benefits of good dental habits in young children. Why Do Young Children Need to Visit the Dentist? The answer to this question seems fairly obvious, but some parents may question the need for regular dental visits for their children. For these parents, the baby teeth are simply going to fall out and regular dental care is not necessary. For starters, dental visits help prevent and treat cavities and tooth decay. Far too many children suffer from tooth decay. In fact, the United States Center for Disease Control (CDC) reported that more than 40 percent of children in kindergarten have tooth decay. A failure to treat it can lead to pain and other indirect issues. Dental research indicates that healthy teeth help children chew more naturally and speak clearer. Studies show that regular dentist visits at a young age lead to a healthier mouth later in life. Along with multiple brushings per day, visiting the dentist instills good habits in your children. Your child is likely to continue these good dental habits as they grow into an adult. Now that it is established that children should regularly see a dentist, it is time to discuss what age should a child go to the dentist. The right time for a baby to see the dentist is not long after birth. In fact, both the American Academy of Pediatrics (AAP) and the American Dental Association (ADA) agree that a baby should see the dentist after the appearance of the first tooth. The AAP and ADA both concur that a dental visit should be scheduled right after your child turns age 1. There are some skeptical parents that may think this is too early. However, a dental check-up at age 1 serves a few important benefits. One benefit is that the dentist provides valuable information on how to care for a young child's teeth. The dentist wants to work with the parents to ensure the baby is cavity-free as he or she gets older. In addition, the dentist will also cover bad habits that contribute to cavities and tooth decay. Allowing your child to fall asleep with a bottle of juice or milk, for example, is something the dentist will advise against. After the first tooth breaks through, the dentist also advises breastfeeding mothers to stop on-demand feedings during the night. The dentist will instruct you how to brush baby teeth and other important oral health tips. Your dentist can also help you break a child's habit of thumb sucking or pacifier dependence. Lastly, the dentist will encourage the transition away from a bottle and towards a cup. 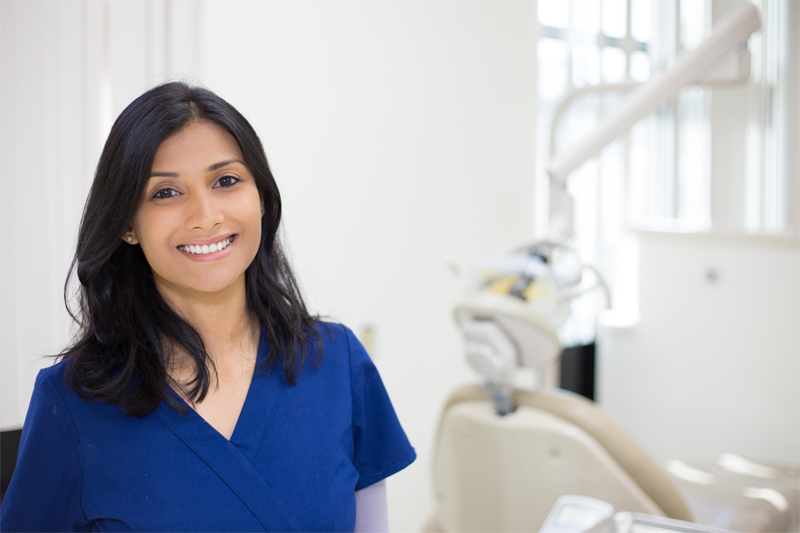 What Should You Expect at the First Dentist Visit? Many parents fear that their child will be scared and unwilling to cooperate with the dentist. However, the first appointment typically goes better than the parent anticipates. One reason is that dentists have experience dealing with babies and toddlers. They are friendly and help the child get comfortable by showing off dental tools and gadgets. Some parents seek out tips for a successful first visit. Dentists suggest eating and napping before the visit to eliminate some common causes of crankiness. Another suggestion is to leave siblings at home because they tend to cause a distraction. Lastly, bring the child's favorite blanket or toy to promote comfort. How Often Should a Child Go to the Dentist? Once the first visit is out of the way, the next question is how often should a child visit the dentist. Like adults, the American Academy of Pediatric Dentistry recommends a check-up every 6 months. This interval is proven to be the most successful in preventing tooth decay and cavities. It is possible for the check-up interval to be more frequent. In special cases, the dentist may want to see your child a few more times per year for monitoring. How Can Parents Promote Good Dental Health at Home? Many do not realize that good home care starts at birth. Parents should start off by cleaning the newborn's gums with a soft, wet cloth or infant toothbrush. When the first tooth erupts through the gums, it is time to start brushing your child's teeth twice per day. Make sure to invest in an age-appropriate toothbrush that is small enough to reach the back without hurting them. Young children are known to swallow toothpaste, which is generally frowned upon. For this reason, use a small smear of toothpaste until they understand to spit the excess in the sink. The dentist may notice that your child is not getting enough fluoride. They may prescribe a fluoride supplement to overcome this deficiency. Another area for consideration is mouth protection during sports activities. Children are starting to play sports like soccer at ages as early as 2. If this is the case, your child should be given a custom-fitted mouthpiece to protect against injury. A mouthpiece will protect your child's teeth, gums, and cheeks. Regular dentist visits are imperative to the dental health of babies and toddlers. By bringing your child to the dentist, you reduce the risk of cavities and tooth decay. Experts agree that the first visit should take place before the child's first birthday. If you want to learn more about what age should a child go to the dentist, please contact us to schedule an appointment today. An American Association of Endodontists survey discovered that 80% of adult Americans have the fear of the dentist. More than 50% say this fear can stop them from visiting a dentist, and about 5-10% are considered dental phobics--individuals so scared of dentists that they'll do whatever they can to avoid dental care. The idea of a routine tooth cleaning causes fear in grownups, so it's natural that children may also find dental visits rather daunting. Is your kid scared of a dental visit? If so, here's how to help them relax before their next dental checkup. Start your kid's visit early on. Kids should have their first dental visit as soon as possible--ideally the first birthday. Dental offices are built to help kids have a relaxed and comfortable visit. A child dentist often applies medicine to ease dental fears there and then, such as oxygen inhalation or nitrous oxide. More importantly, however, communication between the parent, dentist, and child builds confidence and trust that lasts through a lifetime of dental checkups. Sometimes enacting a scenario helps to ease children's fears when they're actually in that situation. For example, playing the dentist with your children helps them get acquainted with what actually happens in a dental office. This can help them prepare better for the visit. Set up a mock dental chair in the living room or dining room, and play the dentist. Examine your child's teeth, pretend to check inside the kid's mouth, count their teeth, and discuss X-rays. Thank your kid for 'visiting' and give them a sticker. Your child will now be a bit more ready for the actual visit. A great way to get your kid ready for routine dental checkups and teeth cleaning is to take them along to some of your visits. If you show your child that you're comfortable, happy and maybe even having fun, they may overcome much of their anxiety. By coming with you, your kid can discover how a dentist visit can help prevent health issues as they grow older. The dentists' training prepares them to treat everyone regardless of age. After 2-3 visits, your kid will get more used to the dentist's routine. If you're not sure of where to look for a child dentist, ask people around you for recommendations on dentists who are good at treating nervous kids. Your local doctor, work colleagues, or friends may be an excellent source to get a recommendation. For a kid seeing the dentist for the very first time, a dentist's mask may be very scary. If you're on your own appointment, introduce the dentist to your child so they cease being a stranger. It's even better if you can point out something you two have in common. For instance: "This is Dr. Jones. He's got a dog like us! May I show you a photo?" By taking your kid to routine dental exams from when they're very young, instead of waiting to fix a painful condition, your kid will realize that a dental visit isn't always associated with pain. Never use the 'P' (pain), 'H' (hurt), or 'S' (shot) words with kids. Let the dentist introduce their own lexicon to kids to help them cope with difficult situations. Instead, tell your kid that the doctor is checking for "sugar bugs" so they can remove them from teeth. You can also tell them that the dentist is going to count their teeth and check their smile. Use positive lines like "strong, clean, healthy teeth" to show the kid that the visit is good fun, rather than frightening and alarming. Reading from a colorful, fun book helps relax kids. Plenty of books have been written about visiting the dentist. They usually describe what goes on in the dentist's chair, and place characters in amusing situations so children can see that visiting the dentist is no big deal. If kids see their beloved characters having their teeth cleaned, they'll think that it's not that bad. When your kid visits the dentist for the first time ever, they may experience anxiety regardless of how much you have prepared them. By staying close, you can help your kid stay positive and calm. This is an excellent way to help your child beat the fear of the dentist and gradually get comfortable having exams on their own. It's normal for little ones to be troublesome, so it's always best to meet with the dentist and dental hygienist prior to the visit and disclose some information about your kid. Tell them about siblings, their beloved Disney character, or their new puppy. This way, the dentist can chat about things your kid can relate to should there a fussy moment. Just changing their state of mind for a minute can eliminate the fear and stop the tears. A reward always helps put a smile on your child's face in a big way. Make a deal prior to the visit. For example, if your little darling can brave the whole treatment they'll get a treat, such as a new book or a trip to their favorite restaurant. You can even create a game. For example, for each smile you see your kid make at the office, you can reward them with points they can redeem for a special gift. These pointers will help you manage your kid's dental anxiety better. However, if you need experienced professional help, please call in a therapist to help your child be more ready and able to stay calm in the dentist's office. At Grout Family Dentistry, we offer comprehensive dental care to all, including children. Contact us today for more information about how we can take care of your child's oral health and help them overcome their fear of the dentist. Dental veneers are very thin shells of man-made, tooth-colored porcelain that is placed over the natural tooth to correct discoloration, cracks, and chips, or hide gaps and misshapen teeth. The application of porcelain veneers is a cosmetic dentistry option that has grown in popularity over the years as more people have sought improved smiles and a boost in self-confidence. Some people aren't so lucky when it comes to the genetics of their teeth and choose porcelain veneers to give them what they weren't blessed with. Others enjoy beautiful teeth in their youth, but wear and tear over many years can have an effect on a once perfect smile. Porcelain veneers are an option for men and women, both young and old, and can correct a myriad of problems from broken teeth to a less than pleasing color. If you've heard about porcelain veneers and been curious if they might be an option for you, read on to discover why so many patients choose porcelain veneers each year. Though there are other veneer options besides porcelain, they're your best bet if you're looking for teeth that are resistant to stains. Porcelain is a popular choice because of its smooth surface that is non-porous in nature. This stain-resistant ability comes from the process the porcelain undergoes during lab manufacturing. This process that enables the veneers to stay whiter, longer. Even with porcelain veneers, however, it's always a good idea to steer clear of food and drinks which tend to stain teeth. Lots of coffee and red wine, for instance, will slowly take away from the clean, bright, white effect that you love about your teeth, no matter what. Patients who are undergoing a dental procedure do so with the hopes that their results will last a long time. This is especially true when getting veneers; you'll want your teeth to last and look good for many years to come. The good news with porcelain veneers is that they have an extra long shelf life when compared to other veneer materials. Porcelain veneers have a lifespan of around 15 years compared to 5-7 years for composite veneers. If you're serious about getting veneers and investing in a beautiful smile, the route for longevity points toward porcelain. Porcelain veneers will cost more when you replace them, but when you consider how much longer you'll enjoy them without multiple trips to the dentist, you'll discover it's worth the cost for greater durability. Now you know that porcelain veneers are very resistant to stains. But what about your natural teeth that have already become discolored over the years? Your natural teeth can become discolored to a point where they no longer respond to professional whitening efforts. This might happen due to your genetics, as a result of certain medications you've been taking, or because of habits with food and drink that are known to stain. Whatever the reasons, veneers are a great option for instantly whitening those stubborn teeth. Your dentist can apply veneers over the teeth that have become discolored and stained to give you a new, refreshed smile. Veneers aren't only an option for brightening your smile. Some dentists might even suggest porcelain veneers as an option for closing gaps between your teeth. Though veneers can't correct an overbite or severely crooked teeth, a full set of porcelain veneers can cover your natural smile with a smile you're more comfortable showcasing. It's also a quicker, less painful alternative to adult braces which can take a lot of time and patience. Veneers can also cover teeth that are oddly mishap. If you have a tooth or teeth that stand out from the rest because of their shape, a dental veneer can be made to match the appearance of your other teeth. Doing so will give you a more blended, appealing smiled. Even a small crack or chip in one of your teeth can really distract from the overall appeal of your smile. And however minor the crack or chip, the damage can get worse over time and endanger the longtime health of your tooth or teeth. Porcelain veneers can be the perfect option for quickly repairing a cracked or chipped tooth. A single porcelain veneer placed over the damaged tooth will immediately improve it's appearance while strengthening it and protecting it from any future damage. Porcelain veneers are a favorite among dentists and patients for many reasons, but one of the biggest is the ability to match their color, shade, and shape for a completely natural appearance. Those who wear porcelain veneers often feel very comfortable with their choice and rarely worry that other people notice that they have anything other than their own teeth. Porcelain veneers are an all-around great choice for achieving an adjustment to your smile with natural results. There are very few things you can do to completely alter your appearance for the better as quickly and easily as can be done with porcelain veneers. Your smile plays such a huge role in how you look and how you feel. You can decide to cover a couple teeth to better match your natural teeth, or have a full new set of veneers installed and take your teeth several shades whiter and expertly shaped in the process. And with porcelain veneers, your smile can be completely transformed in no time. For most patients, the veneers can be applied in a few appointments, max. To learn more about porcelain veneers and if they're a good option for you, schedule an appointment with one of our experienced dentists. We'll go over all your questions in detail and talk about what kind of results you can expect if you do decide to move forward with porcelain veneers. Feel free to contact us during with any questions you might have in the meantime. We look forward to helping you create the smile you've always hoped for!